A little while ago i had a little twitter thing , especially with Lise Gotell, but also with Karen Pearlston and Michael Plaxton (thanks!) about whether people would be interested in doing some work around mapping out feminist approaches to incarceration and the criminal justice system. 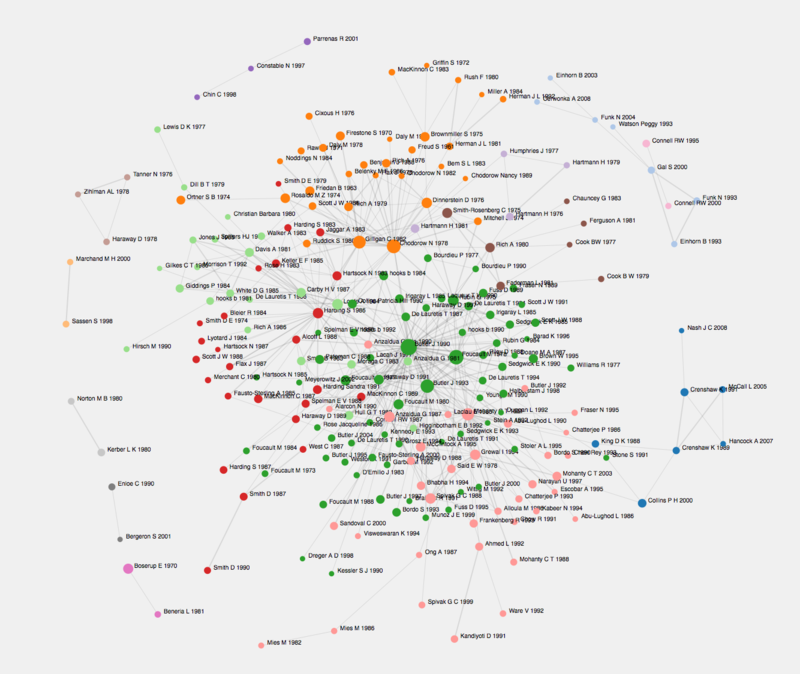 if you have suggestions on tools/techniques for mapping scholarly literature, please let me know – I will compile a set of resources about this kind of thing. My starting point was the feeling that some kind of tipping point has been reached with the term carceral feminism, and I’m starting to hear it more and more (hear, not just read, hear as part of more ordinary conversations not necessarily conversations in a scholarly context). Sometimes I hear it from people who don’t, I think, have a developed position on the criminal justice system, but do oppose carceral feminism. At the very least I’m sure that there are a variety of positions along a continuum of – perhaps it can best be called “feminist engagement with the Criminal Justice System”. I would like to have a map of those positions, one that considers the scholarship, what people have said directly on those issues, how carceral feminism has been defined, and applied, how the term has been critiqued, how it has been opposed, alternative formulations. I think that one of the things i particularly need is for this mapping to illustrate various positions clearly in relationship to each other and over time. I’m not wedded to the term carceral feminism, and I understand that many have a critique that the term is a “straw[woman? ]” (Lise has a piece in a recent collection that is “a critique of a critique of carceral feminism” and has given talks on it) . But i think the question about theory, strategy and practice models about feminist engagement with the criminal justice system are really interesting. I also meant map in a more literal, visual sense. I want a tool where, oh well, in the ideal, a crowdsourced map could be built by scholars, including obviously grad students. I imagine that we could map out some key concepts and linked areas of theory (crit race, indigenous, as two examples amongst many) in relation to which we could place various authors and their works. I think because of the weather and age and all, I feel increasingly frustrated (in an academic sense) the collapsing of important debates into dichotomized positions in which the absolutely (in my view) critical subtleties or even enormous differences between any of the middle positions are ignored, flattened, washed out. I will avoid noting the examples which immediately spring to mind, but no doubt you’ll have your own. I am imagining a resource that would – at least and perhaps at most – describe the issues on which authors in this “middle” differ, and how they differ, what they say when they look at each other’s work, how their work changes over time even.